DESCRIPTION: PTC Computer Solutions was employed as part of the Real Estate Marketing Alliance Team to assist in designing and developing a Marketing Plan to reinvigorate the master planned community of The Forest at Hi Hat Ranch outside Sarasota, Florida. The website, as part of the overall marketing, was the first aspect of this and included much of the overall rebranding and marketing concepts. 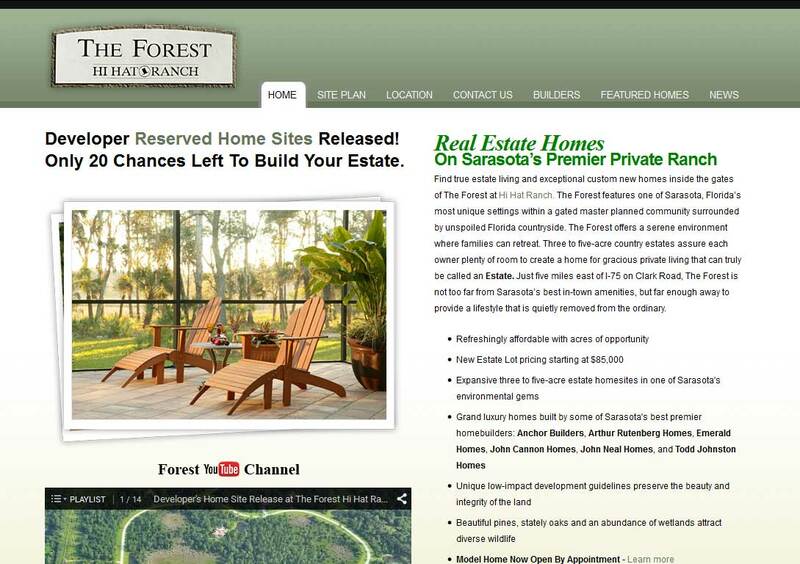 The Forest features one of Sarasota, Florida’s most unique settings within a gated master planned community surrounded by unspoiled Florida countryside. You can find out more by going directly to their personal website, www.theforestathihatranch.com, or contact them directly at Brian.wood@sothebysrealty.com or (941) 928-8408.